exotic objects in space. Above: Supernova 1987a in the Large Magellanic Cloud. A team of investigators searching for supernovae was caught by surprise recently when it observed a “mysterious object” growing explosively and inexplicably. The event was so unprecedented that astronomers did not know how to categorize it. The object was discovered on February 22nd, 2006, and was first thought to resemble a supernova. But its brightening and its spectrum didn’t fit. Astronomers cannot even say how far away it is, because of its redshift anomalies. According to Kyle Dawson of the Lawrence Berkeley National Laboratory in California (a member of the Supernova Cosmology Project), "It could be some galactic variable [star], a supernova or a quasar. But none of those makes any sense." Unlike the normal supernova that takes twenty days to reach peak brightness, the mystery object brightened for at least 100 days, achieving a 200-fold increase in brightness after its first observation. Fundamental to the enigma posed by the object is its redshift. Astronomers use redshift as a means of determining an object’s speed of recession from the observer (and from this they calculate distance). But how far away this object is remains a mystery. According to the New Scientist report, “If the strongest feature in the spectrum is a pair of calcium absorption lines, its red shift would be 0.54, corresponding to a distance of 5.5 billion light years. Dawson said, “It's still going to be visible for another 2.5 months on the ground. We hope the spectrum will evolve and we see some features we can recognize." This is yet another example of a redshift incongruity suggesting that something could be profoundly wrong in the astronomers’ assumption that redshift provides a reliable measure of distance. It is also apparent that supernovae are not as well understood as we have been led to believe. The different types of supernova explosion require different precursors and causes. And researchers have been confounded by observations of supernovae that do not live up to expectations. This latest report seems to add another misfit with theory. 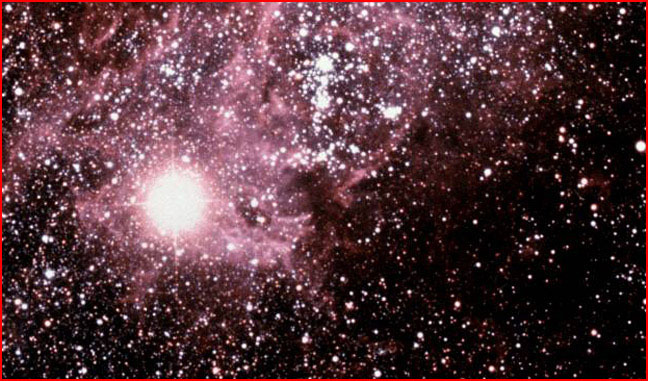 Perhaps Supernova 1987a (image above) provided a clue. As reported by Wallace Thornhill, this earlier observed explosion defied expectations of astronomers while exhibiting all of the peculiar features expected of a powerful plasma "Z-pinch.” Direct observation thus suggests an electrical cause for supernovae, and the more recent deep space explosion should be examined for electrical signatures as well.